There are few places today’s Americans can go without being bombarded by food. We have restaurants in our parks, our furniture stores, and sometimes our gas stations. But even in the U.S., there are still a handful of places where it would feel unnatural to chow down. That wasn’t enough to stop these business owners from choosing some rather unconventional locations to open their eateries. If you ever dreamed of eating a four-course dinner inside an authentic yurt, now you don’t have to travel to Mongolia to do so. The Yurt at the Solitude Mountain Resort is located about 30 miles outside of Salt Lake City, Utah, but diners are still required to make a bit of a trek before they can sit down to enjoy their meal. Patrons are guided on an “evening snowshoe adventure” that lasts a little less than half a mile through a lantern-lit forest. Then for $125 per person, a group of no more than 24 guests can enjoy a gourmet meal that chefs prepare right in front of them. After trudging through the snow to get there, we’re sure anything served warm would taste delicious. “Restaurant” and “sweatlodge” are two concepts that should never cross paths, but unfortunately they already have at this Chicago establishment. Male guests at the traditional Russian bania begin the experience by sweating out toxins in the sauna as employees come around to beat them with a bundle of leaves. They then rush into a cold-water bath, a shock that’s supposed to be good for the circulatory system. After spending the day sweaty and naked, they can then retreat to the café for delicacies like borsht, marinated herring, and steamy chicken soup. Few things are more American than cars and burgers, so it should come as no surprise that there’s a place in Texas that sells both. The Frank Kent Honda dealership in Fort Worth is home to the Twins Creek Café, a classic eatery that serves burgers, salads, and even breakfast foods. Their signature menu item is the “OMG” Burger that’s made with a secret blend of ground beef cuts and can come served on a jalapeño bun. Even if you don’t leave with the car of your dreams, at least you can go home with a full stomach. At this Laundromat/restaurant, diners don’t have to rush home if they spill gravy on their nice shirt. A “state of the art” Laundromat is connected to Washbanger’s bar and restaurant, which serves up gut-busting fare like their jalapeño cream cheese burger and coconut pecan pie. Located next to Texas A&M University, the establishment mainly serves college students, who are notorious consumers of both self-service laundry and greasy foods. The concept is actually a brilliant way to get patrons to spend more money as they’re waiting for their clothes to dry. Maybe more Laundromats should start serving burgers. Guests at this undersea-themed restaurant in Nashville have the pleasure of dining in the presence of a floor-to-ceiling, 200,000-gallon aquarium. The atmosphere is the perfect way to get diners in the mood for menu items like fish and chips, fried calamari, and grilled mahi mahi. The possibilities for “see food” jokes are endless. Fife & Drum in Concord, Massachusetts is the only restaurant in the country serving meals made by prisoners. Customers must go through security before entering the restaurant located inside the Northeastern Correctional Center. They can then enjoy a prix fixe, made-from-scratch meal, all for the price of $3.21. It’s part of the minimum-security prison’s culinary program, which is meant to equip inmates with the skills they’d need to work in a restaurant after their release. The restaurant’s website describes itself as “the watering hole under the rock,” and that’s pretty much what it is. The Tuscumbia, Alabama establishment is built beneath a cliff overhang and has outdoor seating so guests can get the full experience of dining among the natural beauty. The saloon adheres to an Old West theme, serving up fare like “giddy-up sticks” and “chuckwagon nachos.” Some nights they even have live bands utilizing the cave’s natural acoustics. The Hindu Temple Society of North America in Queens, New York has been a prominent meeting place for American Hindus since 1977. In addition to being a venue for religious services, classes, and concerts, they also serve Indian food to the public from their basement. Offerings at the Temple Canteen range in price from 50 cents to $5.50, and they even accept credit cards. The Wabash Jewelers Mall in Chicago is a great place to shop for necklaces, engagement rings, and some of the best falafel the city has to offer. The Oasis Café is located in the back of a jewelry store, and offers Middle Eastern specialties like hummus, tabouleh, and baba ganouj. Everything’s under $7, so you’ll have plenty of money left over to go diamond shopping afterwards. New York's critically acclaimed M. Wells Dinette is located in Museum of of Modern Art PS1, in a building that used to be a red brick schoolhouse. As an homage to the location’s history, the restaurant has adopted a classroom theme, seating diners at desks and plastic chairs and providing them with composition notebooks to doodle in. Specials are scribbled on the classic green chalk boards at the front of the room and gourmet meals are served on tin cafeteria trays. 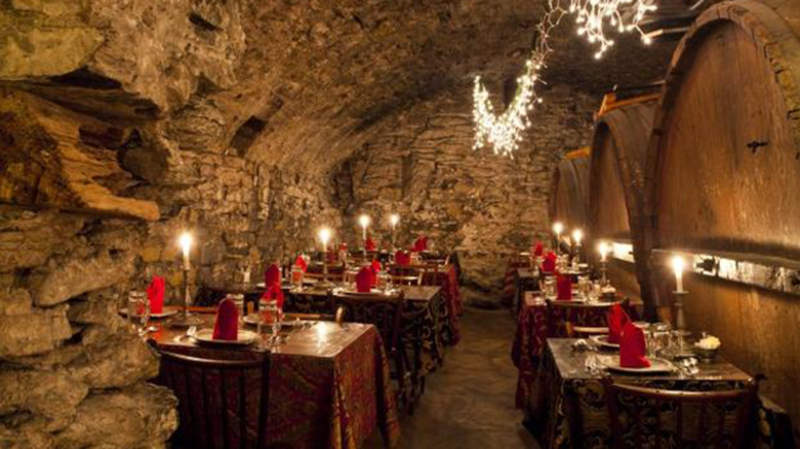 Located several stories beneath Bube’s Brewery in Lancaster, Pennsylvania lies the Catacombs restaurant. Diners can enjoy fine wines, local brews, and classic delicacies within the confines of the stone-lined vaults. Before descending to their dinner, customers are greeted by a “costumed guide” who takes them on a tour through the brewery. The establishments also offer ghost tours, because according to the owners, paranormal activity is everywhere within the buidling. Some of the best pizza in Alabama is being fired up inside a historic post office. Post Office Pies opened in the former Avondale post office in 2014, and they’ve already earned a spot on Thrillist’s list of 33 best pizzas shops in America. Oddly enough, they don’t deliver.